A delicious way to use up leftover cranberry sauce!A delicious way to use up leftover cranberry sauce! The first thing you need to do is to sour the milk with the lemon juice, the reason we are souring the milk is to help the chemical reaction with the baking powder that is in the flour giving you a much better lift thus giving you a lighter scone. Grate the ½ apple including the skin. Sift the flour and the cinnamon together into a large bowl. Carefully rub in the cold diced butter. Add the sugar and the grated apple. Next add your cranberry sauce. Add the soured milk to the mixture and knead lightly. Tip out onto a floured surface and roll to a thickness of 4 to 5 cm. 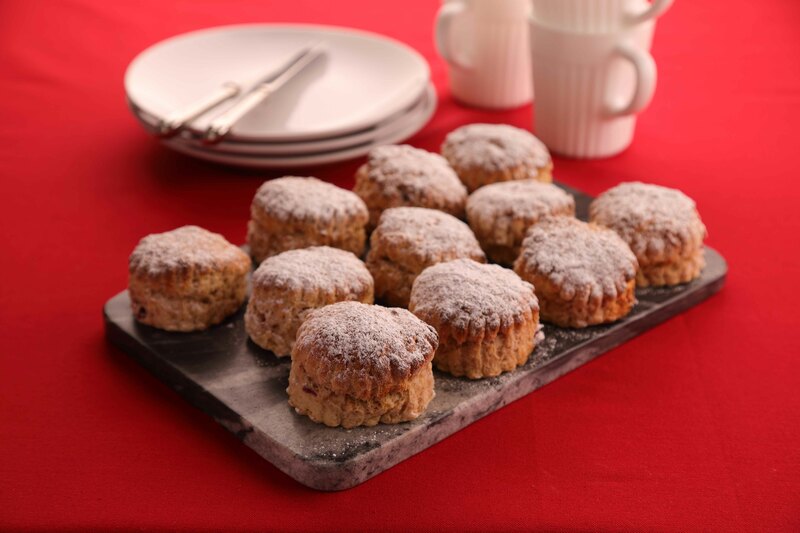 Use a crinkled cutter and cut your scones to the size you require, put on a non-stick baking sheet (I find that if you bunch them relatively close together I get a better lift) brush with milk and cook for about 10 to 16 minutes depending on size.